"Oh, it's so much better now they're not trying to be funny." There is a cut right in the middle of the new Bond movie that elicited a genuine shock of a laugh and after coming out of the cinema, I realized that I had not had as much sheer fun watching a Bond picture for quite a while. I actually think Casino Royale is a stronger movie but Skyfall is so well crafted, so well performed by a dream cast and has a villain so Flemingesque – a perfect foil to Craig's terrific Bond – that the phrase "What's not to like?" cropped up time and time again. I will keep the review spoiler free but cannot help connect this movie with another in the franchise because of one very important aspect. I'll leave that to the last two paragraphs with a full spoiler warning. It seems odd to be able to spoil a James Bond movie as you mostly know what you're getting in broad strokes; there'll be at least three chases even if you don't know what the vehicle(s) will be. You'll be treated to a modicum or glut of globetrotting and the villain usually has some physical grotesquery about him or her. There will be at least one woman sacrificed. You do not expect to be emotionally engaged because Bond is such a long-standing and intimately known character and as the official ringleader of the circus, he can't deviate too far from 'Queen and Country' and duty inspired violence. The movies have to deliver based on the template. Yes, Craig's first outing was heavily influenced by the Bourne franchise and 9/11 has put paid to any real Roger Moore flippancies. But with the humour dialed down (I can barely remember two moments at which I smiled in Royale) a little bit of the fun had drained out. Mendes has not only put the fun back in, he's also made it resonate emotionally. That's quite a trick for a Bond movie and chances are taken, chances that I would have been nervous about myself in his shoes. In the pre-title chase, Bond is mid-mission and has to stop a man with a stolen hard drive full of agents' names and undercover duties. After some impressive metal on metal action, his partner in the field has to take a risky shot and in the movie's first elicitation of a sharp intake of collective audience breath, she hits Bond by mistake who is thrown off the top of a moving train. Missing and presumed not hale and hearty, M (Dench on winning form here) writes Commander Bond's obituary. Once the villain gets his hands on the hard drive, M is subsequently targeted by ex-agent Silva for her past deeds. 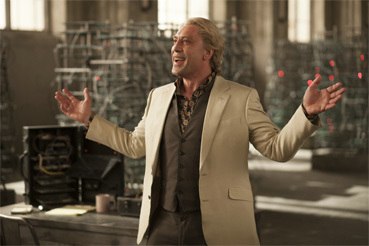 Silva is a twisted cyber terrorist, Julian Assange on crack, a hacker par excellence, a power player and Javier Bardem's performance is one of the film's many highlights. He is pitch perfect with a tremendous range. He can be coolly sardonic, expressly frightening and funny with just one line. What is it about Bardem's hair? Do these idiosyncratic hairstyles have their own casting demands? He's not given too much screen time but he makes each appearance count. The introduction and interrogation scene between Bond and Silva is another highlight and kudos to Mendes introducing this warped genius in one creeping long shot of Bardem telling a compelling story as he introduces himself to Bond ending up in a mesmerizing close up. Great stuff. So the story is essentially protect M and it leads to a stunning conclusion deeply dug into Bond's childhood home in Scotland. Bond aficionados have a whole welter of nods and winks to enjoy but none undermines the story or takes you out of it in any way. We have a new Q in the form of the youthful Ben Whishaw from whom Bond first moves away thinking the thin young man in an anorak is propositioning him. The Goldfinger Aston Martin makes a welcome appearance and has quite the starring role in the latter part of the movie. There's even a Live And Let Die nod in terms of escape via the backs of dangerous animals. I imagine if you know the books, there are references all over the place. But even though it's a fifty-year old franchise, Mendes has pulled off a contemporary revenge thriller with enough surprises and wit to satisfy the most jaded cinemagoer. Spoiler Alert – I reveal the movie's ending in the next two paragraphs to make a rather large point. Do not read on if you want to go in not knowing... In my defence, the movie's so called 'revelation' has been rumoured for ages before the release and subsequent interviews have sort of confirmed it. If you want to stay unspoiled now's the time to stop reading and go and revel in the hugely enjoyable Skyfall. The movie starts with Bond presumed dead. His physical and mental powers are at a low ebb. Beer drinking?! He doesn't pass standard fitness tests. He's unshaven. He can't shoot straight and clings to the bottom of a lift and cannot keep holding on. This is a Bond first, a Bond with doubt and physical limits. This is a minor shock and a major deviation from the formula. When Pierce Brosnan's arm is injured in The World Is Not Enough, it seemed narratively uncomfortable. Bond has to be fit at all times. Even shot with a nail gun at the climax of Royale, Bond casually pulls out the nail and carried on so physically unimpaired it seemed like the nail's penetration granted him some sort of immunity. But then Bond is immune and always has been. He gets shot twice in Skyfall's first scene (ouch) and the movie never really explains how he manages to survive the multiple falls and waterfall journeys never mind the bullets. Getting shot is a serious business but this is a Bond movie... But no, despite the doubt in Bond's abilities to function, the entire film is based on achieving one goal and (wait for it) James Bond fails. 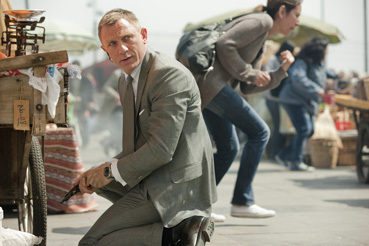 The entire movie is based on Bond's ability to do his job, to protect M. He fails. Yes, the villain is dispatched but M dies... James Bond fails... Now that is a real shocker. In the only Bond film that has a direct relationship with Skyfall, Bond does actually (albeit temporarily) defeat his famous nemesis Blofeld. But his wife ends up murdered by the not quite dead bad guy… Yes, he married in On Her Majesty's Secret Service. Keep up. Bond is made bereft of a woman he loved. What a downer. While Skyfall acknowledges the death of a regular with a replacement in place in the same way that a butterfly emerges from a cocoon, the death is affecting (there are manly tears). The new M is in place (to be suitably respected) but the echoes of the decision to kill off Dench still meant that Bond failed. The idea that we can still enjoy a Bond film immensely, fifty years after the franchise started, by killing off a main character to get a bit of emotion from the stone cold killer, is shocking to me (within limits). James Bond, the James Bond failed and yet, we love him all the more for it. Roll on the next one….